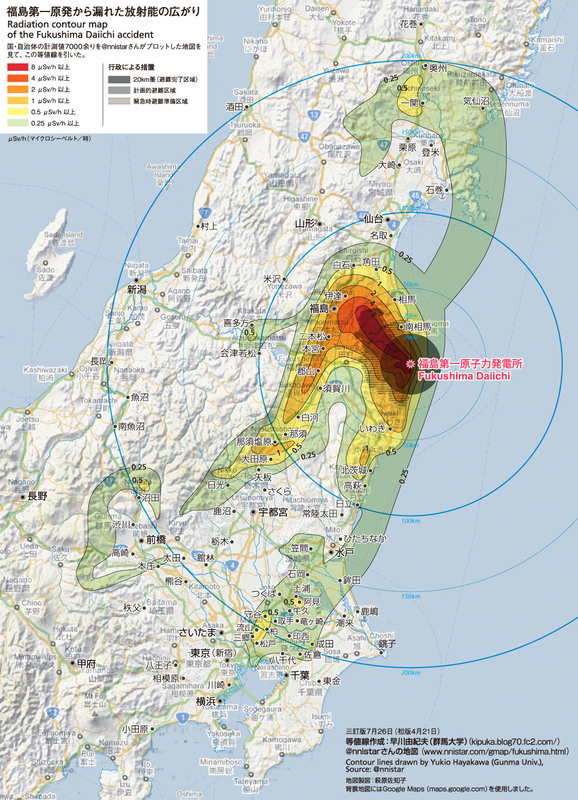 Tokamachi City in Niigata Prefecture is located 205 kilometers west of Fukushima I Nuclear Power Plant. It's not even under the plume according to Professor Hayakawa's map. Tokamachi City in Niigata Prefecture announced on August 22 the result of the survey of radioactive materials in the soil in nursery schools and kindergartens in the city. 18,900 becquerels/kg of radioactive cesium was found in the sludge at the bottom of the container that collects rainwater at a public nursery school, and 27,000 becquerels/kg of radioactive cesium was found in the yard compost pile at a private kindergarten. If the level of radioactive cesium exceeds 8,000 becquerels/kg up to 100,000 becquerels/kg, it has to be temporarily stored at a controlled processing plant. The city will consult the prefectural government as to how to dispose the sludge and the yard compost. The samples were taken on August 12, and tested at a testing laboratory in Niigata. At both locations, the air radiation levels at 1 meter above the ground was 0.10 microsievert/hour and 0.14 microsieverts/hour, both of which were within the normal range. Hotspots like these will continue to appear. Disposal by proper burial of these materials will continue to be needed for many years. Continued repeated monitoring will be necessary. I feel deeply for the people of Japan. My real name is Nelson. I am in Tokyo at the moment for those that already know of me . I have made this video and created a petition to Save the Children of Fukushima. I will be know marching down to all embassies in Tokyo and take the fight to them. I plan to associate with Greenpeace, Criirad and many parent associations as well as public figures. This is for real … the fight is on! Please watch the video but what is important is to spread it around like wild fire ! I have posted it on various sites … Vimeo is the best one for the US, in Youtube it had to be split in two and Daily motion (not recommended for US cause of adds ! It has been 10 hours and between all the sites (and counting) over 2000 people have already seen it ! Many have expressed to me via our FB group that they had no idea what was going on in Japan. I have sent the video directly to Prime Minister Naoto KAN on his blog and is now probably watching as we speak !!! Hope it ruined his lunch. Anyway, please help us !! THis is urgent. For those that “prayed for Japan”, now it is time to “FIGHT FOR JAPAN”. No more Mr. nice guy! It's very very strange that the radiation level around Niigata is very high. The key is the ratio of Cs134/ Cs137. We can know when this radioactive material came from Nuclear Core. From fukushima, it must be almost 1:1. I doubted this radiation material from Kashiwazaki Nuclear plant affected by the earthquake occured in 2004. I heard that near the nuclear power plants it is not so strange to see deformed flowers. TEPCO has Fukushima I, II and Kashiwazaki nuclear power plants. So there are many people who goes to Fukushima and Niigata frequently. I will ask the key ratio to Niigata prefecture. is it possible? jepp, definitely. There was earthquake near kashiwazaki Nuclear Plant on 16 July 2007. All the plants shutdown automatically, but there was some radioactive material released. Of course IAEA says, "No Problem"
@Anonymous - "proper disposal by burial," wishful thinking, Anonymous. Per Gunderson, the Japanese government is authorizing burning of all waste with readings less than 8000 bq/l (with blending allowed (with larger clean samples to reduce the ratio to allowable levels). This, of course, is only "sharing the love," with friends and family the world over. Perhaps that is how Tokamachi (outside the Fukushima plume) received this level of radiation in the first place. Thank you Japanese government. I asked to Niigata Pref. This plus the fact there is over 10,000 tons of radioactive sludge in water treatment plants in Niigata makes me think this is the result of illegal dumping. I'm guessing Fukushima topsoil is getting dumped in the mountains and is washing down in the river. As for these kindergartens, it would be likely a local is washing his truck close by. A truck that is used to enter the Daiichi plant or for hauling contaminated topsoil and/or other radioactive debris in Fukushima.